Saturday is one of the biggest days at Comic-Con; therefore, I stuck to my own advice and aimed for the non-Hollywood panels. First stop that morning was the Reading with Brains – Zombie Fiction because I am a big fan of Max Brook, author of Zombie Survival Guide and World War Z. 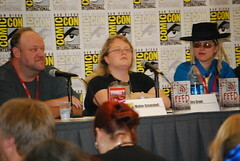 It was my favorite panel at the convention- who knew that these zombie writers would be so entertaining and hilarious? 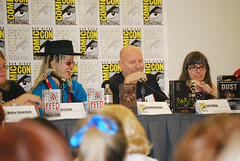 The other panelists were Seth Grahame-Smith (Pride and Prejudice and Zombies,Â Abraham Lincoln, Vampire Slayer), Walter GreatshellÂ (Xombies: Apocalypticon), Mira Grant (Feed), John Skipp (Zombies: Encounters with the Hungry Dead), Amelia Beamer (The Loving Dead), Joan Frances Turner (Dust) and Ryan Mecum (Zombie Haiku). After the panel, I got my copy of World War Z signed. That was one of my big goal that I accomplished at the con! Yeah! 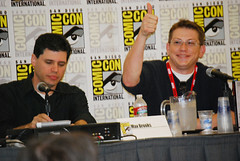 Max Brooks was so awesome and nice. He even signed a comic book of Recorded Attacks for me. 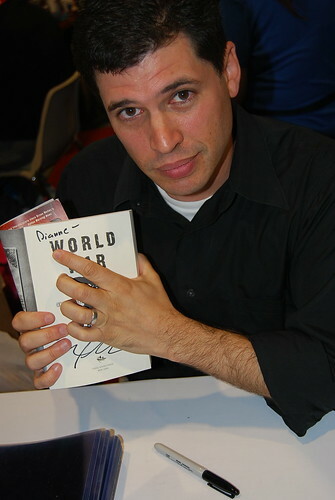 Max Brooks with my book. 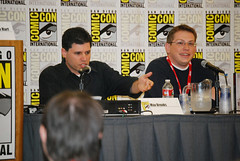 Check out these videos from the panel! More videos behind the link. Zombie fiction’s relevance in modern society, plus Twilight the Sitcom. Was Zombie Survival Guide meant to be funny? Wal-mart, Kohls, or Distribution Center?